It had been raining every day for two weeks. California was finally finding some much-needed relief from a severe, two-year drought. Esben Holmboe Bang is the Danish chef of the two Michelin-starred restaurant Maaemo in Oslo, Norway, where I had the chance to dine earlier this year. He was the tenth guest chef to cook at this year’s Twelve Days of Christmas hosted by Christopher Kostow, with wines paired by Colgin Cellars. Esben Holmboe Bang’s dishes were relatively light in size, but full on flavor. 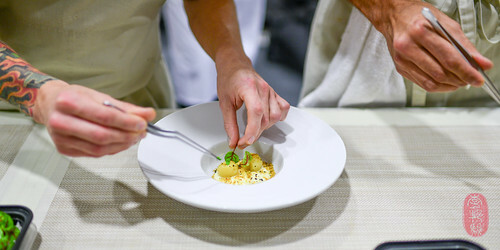 He started the meal with a small but rich and creamy combination of oysters and mussels, rife with the flavor of dill. 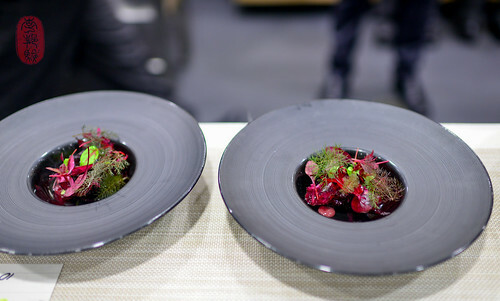 This was a dish that I had at Maaemo earlier this year. I had also had his charred onion dish before. As it appeared at Maaemo, this course included a quail egg yolk that had been coddled in bone marrow fat, and tangy onion-thyme vinaigrette that was chunky with fenalâr (a type of cured lamb meat). Caviar, chestnuts, chicken stock: these comprised a small, but mighty dish. Two bites, and it was gone. But the memory of the contrasts drawn by it lingers: salty and sweet, cool and warm, the luxurious and the humble. It was my favorite course. Christopher Kostow anchored the meal with meat and potatoes. From years past, he brought back those small butterball potatoes cooked in beeswax. They sat on a creamy bed of whipped potatoes, garnished with baby blood-veined sorrel. There was a tender round of pork, glazed in acorn miso, and served with meaty hoshigaki dried persimmons. 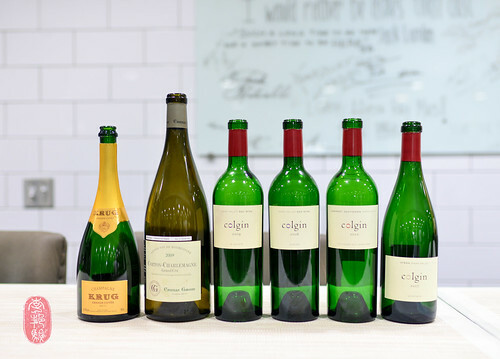 And, because Paul Roberts, Master Sommelier and Chief Operating Officer of Colgin Cellars, requested it to be paired with the wine, Kostow served Snake Rivers Farm beef. It appeared on the menu as “Paul’s Beef.” I thank Mr. Roberts for his request, and Kostow for granting it in the form of a beautiful cut of the bavette, which was sauced with a beefy shiitake mushroom reduction. It paired wonderfully with the Colgin reds. Holmboe Bang’s dessert, entitled “The Norwegian Black Currant Bush,” spurred lots of discussion in the dining room. 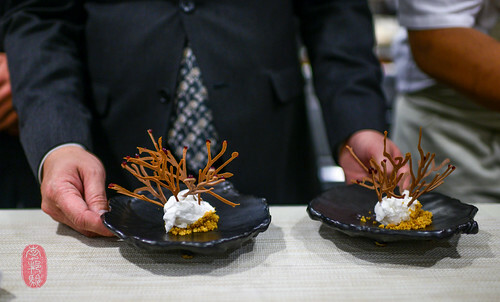 The plating alone — a forest of piped, tuile “branches” in a snowy bank of black currant-flavored ice cream — was a conversation starter. But after diners started digging in, their attentions turned to the flavor. Some liked it. Some didn’t. I have to admit, even though I liked the flavor, it was an unfamiliar one. I’m tempted to describe it as odd, if it weren’t for the fact that it was, perhaps, simply unexpected. In my experience, currants have a tart, bright, red fruit flavor, sometimes with a darker, raisiny aftertaste if they are dried. This Norwegian currant was unexpectedly floral, with a much warmer, more tropical feel. It had what I can best describe as a green banana flavor. Regardless of what I thought, I really enjoyed seeing the reactions of those around me, and hearing them work through their differences with one another. 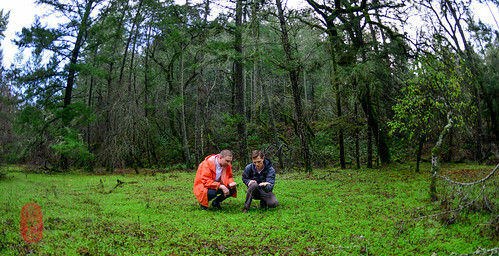 Dinners, like the ones hosted by The Restaurant at Meadowood during the Twelve Days of Christmas, seem to draw a self-selecting crowd of more adventurous diners. And it’s always a joy to participate in the refreshingly open and free exchange of opinions at the table. Juniper gel, juniper powder, vinegar. ~ by ulterior epicure on December 29, 2014.